Edmonton Oilers superstars Connor McDavid and Leon Draisaitl are undoubtedly the most dangerous offensive duo in the NHL. Since 2016-17, McDavid and Draisaitl have combined for 566 points, which is 53 points more than the next highest scoring duo (Sidney Crosby and Evgeni Malkin) in the league during that time. McDavid recorded his 100th point of the season in a 6-3 loss to the New Jersey Devils on March 13. The 22-year-old phenom became just the 19th player in NHL history to reach the century mark in three consecutive seasons and the first to accomplish the feat since Alex Ovechkin from 2007-08 through 2009-10. McDavid has 112 points in 72 games in 2018-19 with six games left to play. Draisaitl, meanwhile, had four points in an 8-4 victory over the Los Angeles Kings on Tuesday to bring his point total to a career-high 99. The 23-year-old German needs just a single point to reach 100 and still has six games to do it. If he reaches the milestone, McDavid and Draisaitl will become the first Oilers teammates to each score 100 points by age 23 or younger since 1983-84. During the 1980s, the Oilers had the greatest collection of talent ever assembled in NHL history. In three of the franchise’s first five seasons in the NHL, multiple Oilers players put up 100 points before turning 24. Each player that accomplished the feat has been inducted into the Hockey Hall of Fame. Now, McDavid and Draisaitl are within striking distance of adding their names to this list. Their minds are surely more focused on getting the Oilers into the playoffs despite dwindling odds. Still, it’s impossible to ignore how remarkable it would be to have two teammates each score 100 points in the modern NHL, especially given their young age. McDavid has already joined Gretzky, Kurri, Messier, Coffey and Anderson as the only Oilers players with at least three 100-point seasons. If healthy, McDavid should be a regular 100-point scorer for the next decade or longer. Coming off consecutive 70-point outputs, Draisaitl has taken his game to a new level this season. This could turn out to be the high-water mark for his career, or maybe he’s just starting to scratch the surface on the type of player he could become. Nonetheless, he’s established himself as a guy you can count on to produce a point per game. Not only would McDavid and Draisaitl each recording 100 points be significant for the Oilers, it’s extremely rare around the league. In fact, Malkin and Crosby are the only set of teammates in the last 25 years to each score 100 points at age 23 or younger, when they had 113 and 103 points respectively in 2008-09. 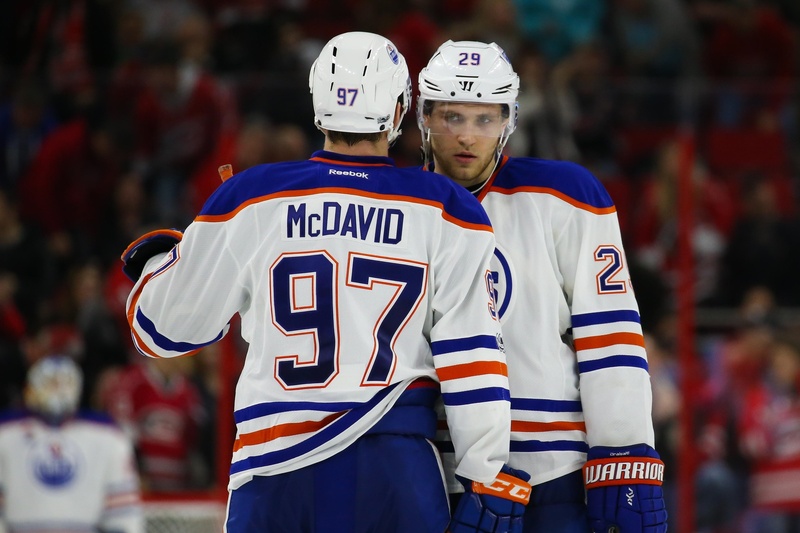 Despite the team’s struggles, McDavid and Draisaitl have given Oilers fans a reason to watch every game this winter. And while No. 97 and No. 29 are trying to achieve something special together, they are each closing in on individual marks as well. McDavid, who is on pace for 121 points this season despite missing four games, should reach at least 120. The two-time defending Art Ross Trophy winner has an uncanny internal drive, and has had multiple points in 10 of his last 12 games, so there’s no reason to bet against him. Moreover, McDavid knows that for the Oilers to have any shot of making the playoffs, he needs to lead the charge offensively every night. McDavid could become just the second player since 2007-08 to score 120 points in a single season, and the first Oilers player to do it since Messier in 1989-90. 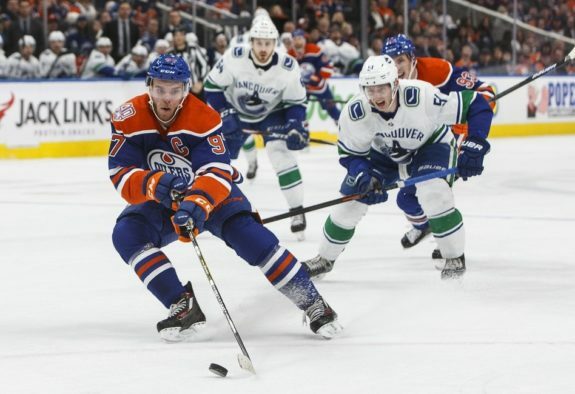 He’s also just one goal shy of his second straight 40-goal season, which would make him the first Oilers player to score 40 goals in consecutive seasons since Kurri in 1987-88 and 1988-89. Scoring 100 points would likely be the top individual moment of Draisaitl’s NHL career. And after putting up 15 goals in 15 games between Jan. 20 and Feb. 27, Draisaitl has given himself a real shot at 50. Draisaitl could become the first Oilers player to score 50 goals in a single season since Gretzky and Kurri in 1986-87. Really, McDavid and Draisaitl don’t care how many, or how few points they score as long as Edmonton makes the playoffs. And that’s the mentality you want from your leadership group. So, although it’s mostly been a season to forget in Oil Country, McDavid and Draisaitl have provided plenty of memorable moments. And there might be a few more to come.